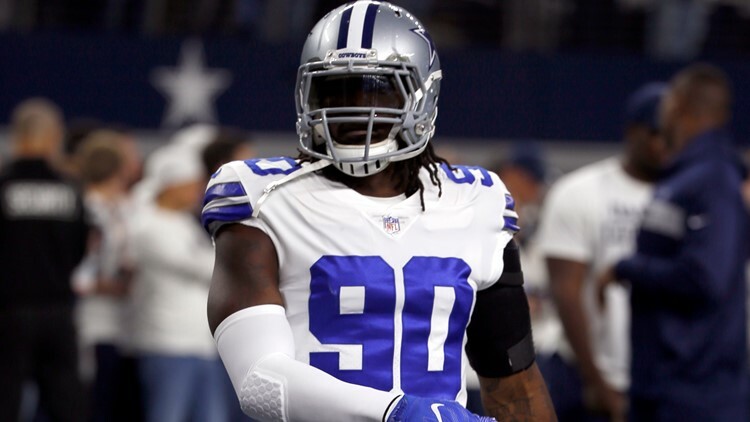 DALLAS — Defensive end DeMarcus Lawrence signed a five-year, $105 million contract extension with the Dallas Cowboys on April 5. The contract represents what the former 2014 second-round pick from Boise State was able to accomplish for the team with two Pro Bowl selections and leading the team in sacks three of his five seasons. However, the question people have now is what Lawrence is going to produce with his new contract. One myth that fans have about players when they get their money is that they start to slack off. In Lawrence's franchise-tag year of 2018, he actually put off getting labrum surgery in October because he wanted to lead the Hot Boyz and not summarily end his season. Any money-conscious player would have made the business decision to get the surgery and see what the market had in store that offseason as they had already recovered from the surgery, which is a three to four-month process. Lawrence has referred to the new contract as a "blessing" and that it sets up his grandchildren. Certainly Lawrence can't help but notice the pecuniary abundance of the contract, as any human would be unable to avoid. However, now that he has his money, it isn't going to take the edge off his desire. The potential issues that could come about on Lawrence's new deal are related to availability and production. It is worth mentioning that his rookie season was limited to seven games because he broke his foot in training camp and started out on the physically unable to perform list. Then, at the conclusion of the 2015 season where he played in all 16 games, Lawrence had back surgery. After the 2016 season, it was the same story, and in 2018 he played through a torn labrum. While the takeaway from Lawrence's injury history is that he is as tough as a boot with the amount of pain and aggravation he has played through, the subtlety is that there is a durability concern, which could crop up as a durability issue. In his career, Lawrence has missed 12 games due to injury. The 6-3, 265 edge defender will be 27 years old on April 28. There is no doubt that, presuming availability is a given, Lawrence is about to enter the prime of his career. Since 2000, of the 109 10-plus sack seasons among defensive ends, 20 of them came from 27-year-olds. The number rises to 26 by age 28, stays at 26 for age 29, plummets to 16 at age 30, by age 31 descends to 11, and falls to 10 at age 32. In terms of 15-plus sack seasons among players between the ages of 27 and 32, there have been 14 of them since 2000, and 10 of them were collected by players in between the ages of 27 and 29. There is no question that the Cowboys will be the beneficiaries of a career season from Lawrence that could coincide with defensive ends Randy Gregory and/or Robert Quinn being on the roster. Like the late 2000s Cowboys, the current Cowboys have that combination of a franchise quarterback and a pass rusher in his prime, two of the three big positions teams try to build their rosters around. The only element that could derail this boon for Dallas would be injuries. Houston Texans defensive end J.J. Watt, a three-time NFL Defensive Player of the Year, had two seasons of his prime at age 27 and 28 robbed from him due to injuries. When he was fully, completely healthy, he picked right where he left off and collected 16.0 sacks last season, becoming only one of 16 players since 1982 to record 16-plus sacks at age 29 or older. What could he have done at age 27 or 28 if fully healthy? Dallas may get to answer that question with Lawrence if their war daddy stays healthy. If a career-year from Lawrence can coincide with quarterback Dak Prescott playing at a high level and running back Ezekiel Elliott continuing his dominance as the NFL's leading rusher, then the Cowboys would have enough elements to play in a conference championship game for the first time since 1996. Do you think DeMarcus Lawrence will be able to keep his production high during his new deal for the Cowboys? Share your thoughts on Tank's longevity with Mark on Twitter @therealmarklane.